East Jutland is the eastern part of the peninsula of Jutland. It is only 3,5 hours by train from Copenhagen. The region has an amazing combination of fertile landscape, expansive forests, sandy shorelines and bustling big cities. The beautiful hilly landscape is a result of the last glaciation, here the big glaciers formed the nature. The second biggest city in Denmark - Aarhus is located here. The dynamic city invites to all kinds of experiences like museums, fascinating shopping streets, good restaurants, cafes and amusements. In 2017 Aarhus will be European Capital of Culture, which offers a lot of interesting highlights for visitors. All around Eastern Jylland, you will find all kind of exciting outdoor as well as indoor activities. Don`t hesitate to visit East Jutland 2 days or more on your trip. Marselisborg Palace has a long and interesting history. Back in time it was a wedding present from the Danish people to King Christian X. When stepping into Randers Regnskov you immediately find yourself being in a completely different World. Visit one of the amazing animal parks in Denmark. Captivating views of the national park You will be spoiled with spectacular views when visiting Mols Bjerge National Park. From here you can see the whole Mols Bjerge National Park at the Jernhatten ridge. The central area of the national park is made up of high heathlands, forests and large open pastures, while along the coast there are many great beaches to discover. Mols Bjerge Wildlife The Park includes many Bronze Age sites. Ancient towns, villages, churches and old manors show of the story of area´s development through the century. The Ritz Hotel is an oasis, where you will be at an agreeable distance from the rush and bustle of the every day, and where the focus is on cosiness and atmosphere. In the heart of Aarhus you will find this modern 4 star hotel. Hotel Oasia is the newest boutique and design hotel in the heart of Aarhus city. Overlooking miles of elegant coastline, Marselis Hotel - Aarhus reflects the timeless gracefulness and beauty of the Kattegat Sea. Visit one of the most exclusive restaurants in Aarhus. At Gastromé we aim to unite the gourmet rural cuisine with the raw, urban cuisine of the city. We have transformed the countryside gastronomy from the Vilhelmsborg Forest and to our downtown Aarhus location. At Substans we practice the casual gourmet meal. Our focus is on taste, craftsmanship and organic produce from local farmers and manufacturers. And we try to present the food quite neatly. Basically we just want to share our own love of good food. Likewise the wine at Substans is organic and casual, and often unfiltered. Why add a lot of chemicals to wine when it is better and more fun to drink without? You will be spoiled with spectacular views when visiting Mols Bjerge National Park. From here you can see the whole Mols Bjerge National Park at the Jernhatten ridge. The central area of the national park is made up of high heathlands, forests and large open pastures, while along the coast there are many great beaches to discover. The Park includes many Bronze Age sites. Ancient towns, villages, churches and old manors show of the story of area´s development through the century. Maybe you can see otters at Stubbe and Lange lakes, in the north of Mols Bjerge National Park. To the west, you will find the Kaløs marshes and forests are rich with flora and fauna, including rare insects in the park’s trees. It is recommendable to experience Kalø Castle Ruin, the remnants of a royal Middle Age castle or the coastal village of Ebeltoft nearby, with big attractions such as theJutlland Frigate and Glass Museum. The old town hall, from 1576, is very special. 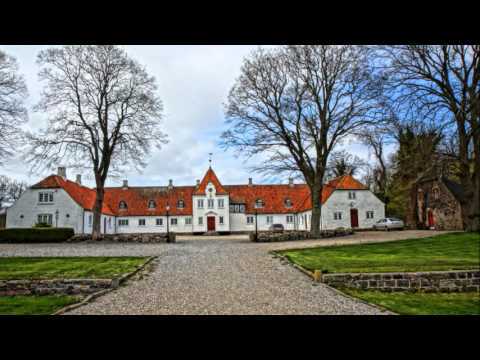 Many couples come to Ebeltoft to be married here as it offers the perfect romantic setting. A number of other very old and well-preserved buildings are situated along the following streets, Adelgade, Overgade and Nedergade. The historic Ebeltoft is surrounded by beautiful scenery, attractive beaches, and a really cosy and maritime harbour environment with delicious restaurants and cafes. The biggest attraction here is The "Fregatten Jutland", a fully-owned maritime environment on the frigate island in the middle of Ebeltoft. Discover the world's longest wooden ship, an authentic frigate, surrounded by the museum hall.